Instead of including a Feature Article, this edition contains an expanded Car Showcase. We will be putting more items on clearance, and will have an end of season special offer in early May. At that time we will send out a short notice to our subscribers to let you know more about this sale. Recently DerbyWorx teamed with BSA to make a video series. Both BSA and DerbyWorx versions were made. Here are links to the DerbyWorx version. 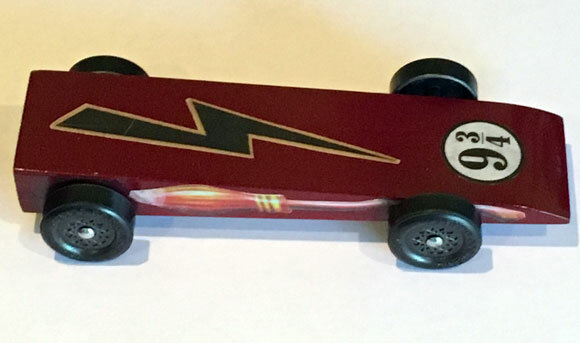 The videos are geared towards people new to pinewood derby racing. consider our MV Basic Car Kits or MV Wedge Car Kits. 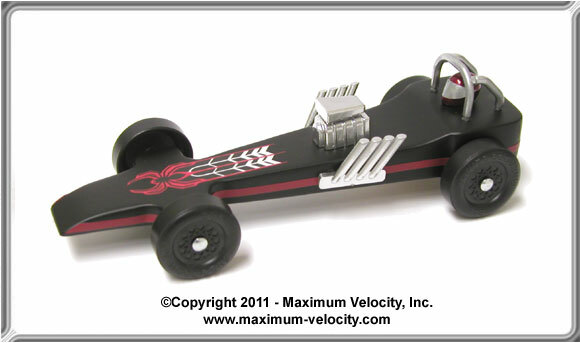 Now is your chance to stock up before your pinewood derby event, or for next season! Through March 21, 2016, you can get 7% off any order of $70 or more. To take advantage of this limited time offer, use coupon code MAR8NL during checkout. Back in 1977 my father and I were restoring a Ford GPW. 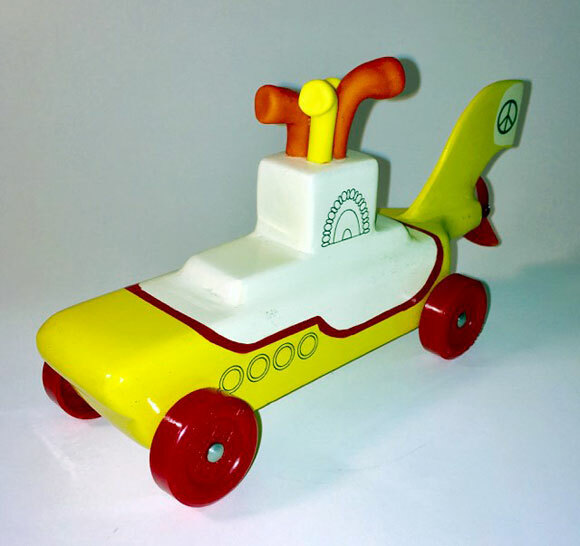 So that was the inspiration for this car. Now I’ve got another ’42 Ford GPW that my boys and I are restoring. Crazy how you repeat things with the next generation! 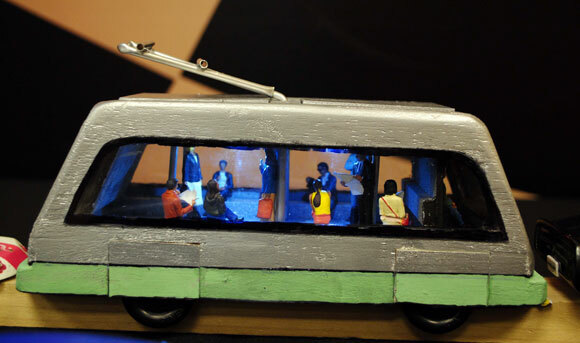 Inspired by Harry Potter, this car won first place in the Tiger den and Pack races. At the district race, it won first place for all Tigers and third place overall. For his last year as a Cub Scout my son Rich wanted a car that honored this new band he discovered called the “Beatles”. I told him they sounded familiar and that I had an idea for a car. I downloaded “The Yellow Submarine” movie for us to watch. He did most of the cutting and sanding and all of the painting himself. Funny how many Cub Scouts got it right away and how many younger parents had no idea what it was. For the record, that movie gave me nightmares as a kid! 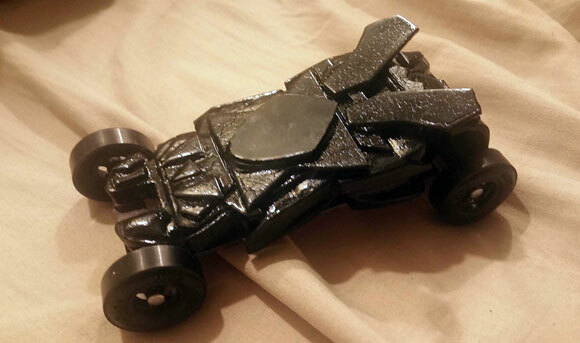 Here is the Batmobile from “Dawn of Justice”. We used the Awana block, with 1/2 inch pine for the sides. We cut out the profile and plan views, ground out side intakes, did a little sanding, then glued sections of sheet plastic to represent the armor, wings, and cockpit. Because of its color, it’s hard to see details, but the layering of plastic sheets give it a very menacing, armored look. It is very short, but there were no stability problems from the short wheelbase. The paint job got some orange peel (actually a lot of orange peel), but the judges thought it was a cool texture – it won the Design award. 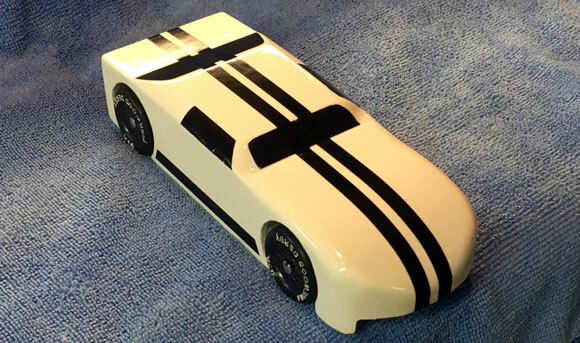 Mach 5 was entered in our 2017 Awana Grand Prix. This was Maggie’s (my daughter, 5 years old) first year racing in the Grand Prix. 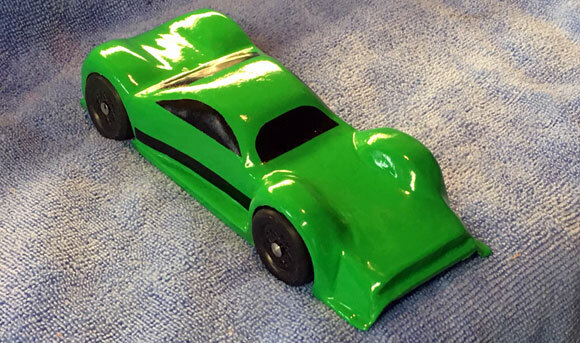 When my son entered Awana, I asked him if he wanted his car to look cool (design), or be fast. He said, “I want it to be super fast Dad!” So we have always gone for speed, not looks. 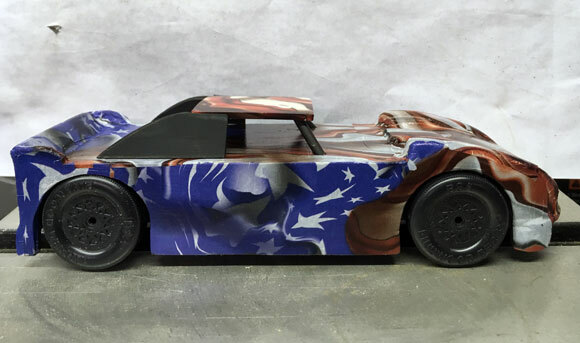 Six years later I asked my daughter the same question/ She said, “I want it to be really cool Daddy!” I said it may be slower than other cars honey, is that all right? She said, “That’s okay Daddy.” (So sweet). Well, it wasn’t slow. Maggie had been watching an old TV show called “Speed Racer”. I told her it was a show that I watched as a little boy. So, she really wanted the Mach 5 as her car. 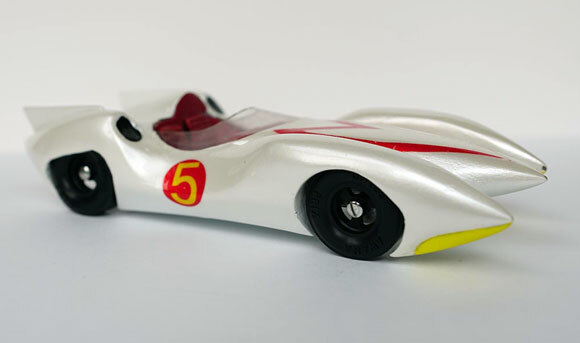 The Mach 5’s main body is the pine block, and the fenders are made out of balsa wood. The windshield is made out of a two liter Coke bottle. 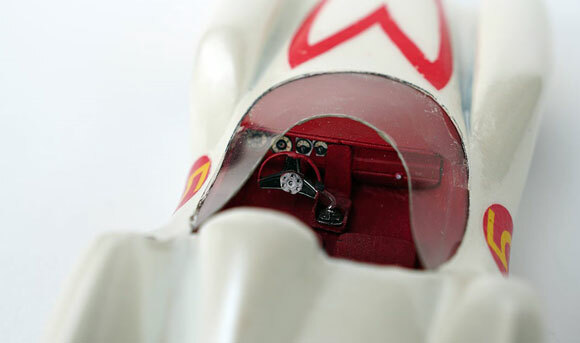 The cockpit is partially from a plastic model. 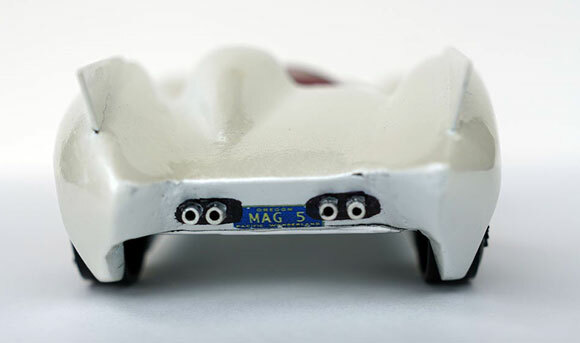 Our goal was to make the finished car’s total weight to be 1.5 ounces, but ended up at 2.01 ounces. Then we added 1/4 inch tungsten cubes.Her car did have a mishap and flipped over and broke the back fin, and keep ramming the stop at the end. So it does have some battle wounds from the race. She ended up beating the four year in a row Champ (her brother Luke). We were all surprised how fast her car was. To top it off, she won first place in Design and came home so proud of herself. My son was a very good sport and he had fun too. 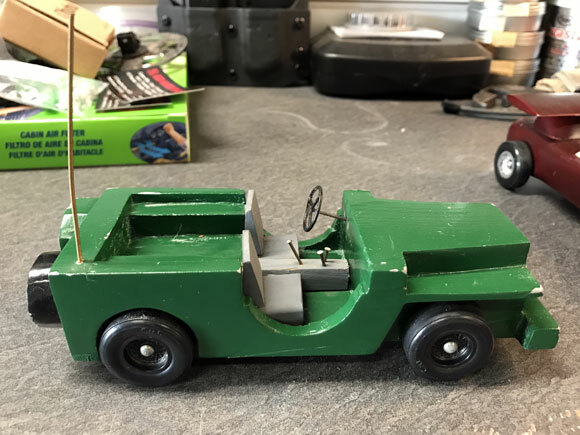 This was the very first car my son and I built. It never lost a race, winning den, pack and district. These are my son’s cars from this year’s race. The “Green Machine” took third place in the outlaw race, and the “White Out” car took first place in the outlaw race. The American flag wrapped “Dirt Late Model” took second in his den race. 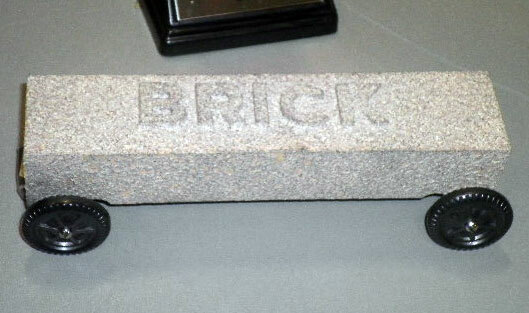 I made a “Brick” car this year. It looks like a brick in shape and color, and feels like a brick in texture. I wasn’t going for speed, but I won anyway, First Place Expedition Ranger Division. My space racer with an alien driver has an orb with randomly flashing LEDs. I designed, built, and embedded the circuit in transparent resin. It took first place. If your story is used, you will receive a $10 coupon in May of 2017. Q: I was looking for any advantage I could get and was curious whether putting graphite on the tread area would help reduce the initial friction the car has to overcome. It makes sense putting it inside the hub and tread edge where it would make contact with the rail. A: There is no benefit to putting graphite on the tread surface, but on the inner edge and inner hub of the front dominant wheel you do want graphite. Mostly, you want to lube in the wheel bore. Fill the bore with graphite, insert the axle, spin several times, add more graphite (without removing the axle), spin some more, add graphite, spin, add, spin, etc. Do this for 5 minutes per wheel, always ending with spinning. Then put the wheels on the car and don’t add any more graphite. Pinewood Derby Times Volume 8, Issue 2. 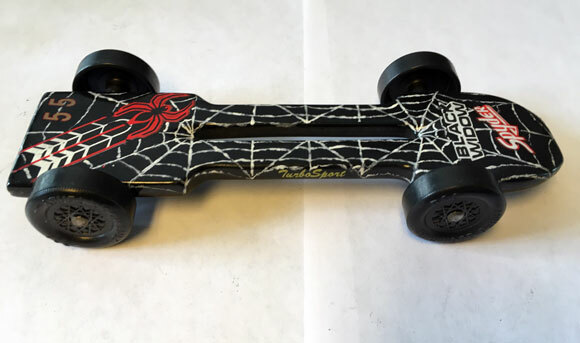 Q: I’m trying to build the fastest PWD car that will still fit within our Pack’s rules. I already own all your polishing kits. I recently purchased your 4080 Pro-Stock wheels. Would you recommend that I do any prep work to the wheels such as smoothing the lathe marks on the outer wheel tread a bit or polishing the inner wheel bore with your pipe cleaners and wheel bore polish? Also, several of the pinewood derby books recommend running in the wheels/axles using a Dremel and a felt wheel once the car is all built. Would you recommend this step if I’m using the Pro-Stock wheels and grooved axles, or is it likely to do more harm than good? A: You can polish the bores with the Bore Polish, but I don’t recommend sanding the tread, as you could knock the wheels out of round. I don’t recommend using a Dremel as it is very easy to damage the bore. Instead, I recommend lubing off of the car using the procedure described in the previous question. 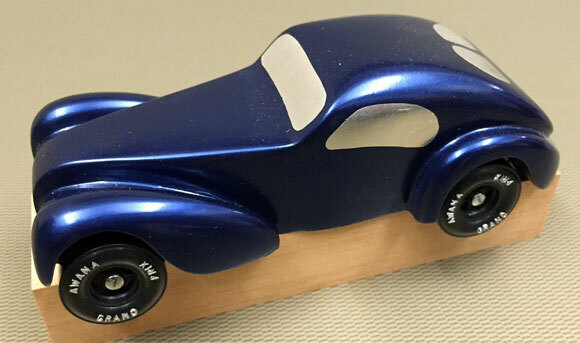 Do you have a pinewood derby-related question? If so, e-mail us your question. We answer all questions by e-mail, but not every question will appear in the Q&A section of the newsletter. Are you a new subscriber, or have you missed some of the previous newsletters? Don’t miss out; all of the issues for Volume 5 through Volume 16 are posted on our web site Here. (C)2017, Maximum Velocity, Inc. All rights reserved. Please do not reprint or place this newsletter on your web site without explicit permission. However, if you like this newsletter we grant permission, and encourage you to e-mail it to a friend. 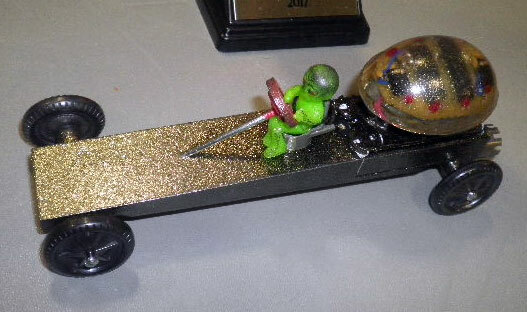 (R)Pinewood Derby and Regatta are registered trademarks of Boys Scouts of America. (R)Awana is a trademark of Awana Clubs International.